The box, in my opinion, is what makes this piece valuable. There are still vintage and antique solitaire boards on the market from time to time along with much nicer looking handmade German glass marbles, but I challenge you to find an original German solitaire box like this. Glass marbles were first produced in the mid 1800's thanks to a German man in Lauscha, after he invented glass scissors. I don't know if the marbles that came with this set are from the original game or not but they all came together with the box and I never separated them. 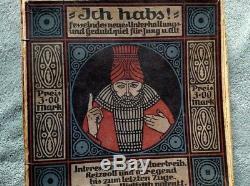 This whole piece was imported directly from a German antique dealer in Lauscha, Germany. Please see last photo for reference. This box and the game's instructions are written solely in German. Take social note of the phrase at the bottom, ges. 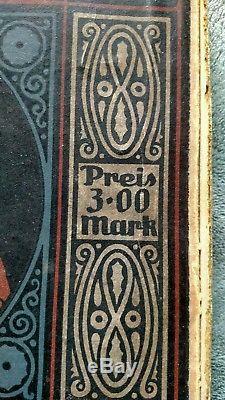 On the front of the box you can see the price is printed as "preis 3.00 mark". 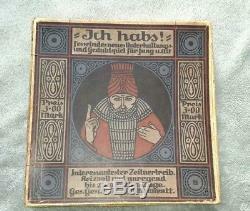 Certain parts of Germany's history make this toy expensive or affordable depending on the year. The art is old world looking and there are no printed notations of the year produced or company that made it. 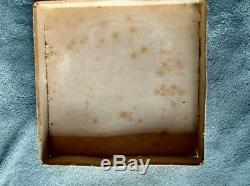 The only other antique solitaire boxes I have ever seen are ones from England or American manufacturers. 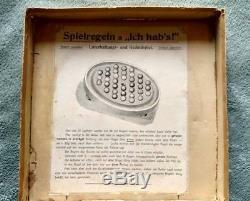 Antique toy boxes tend to be less common as it is but adding the social and economic damage from both world wars into the mix and German toy packaging becomes extremely difficult if not impossible to find from the Golden age when these German marble toys were initially so popular among children. It's a sad but important part in understanding the rarity of this item. 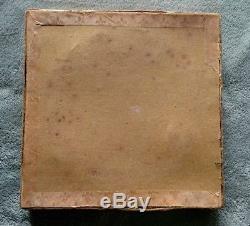 The box measures about 9 inches across and 1.5 inches tall. Please ask any questions and I will see if I might be able to upload a short video or more pictures of this piece in more detail. This is a statement piece for serious collectors only. Any marble or German history buffs feel free to message me with any info I may have not listed. 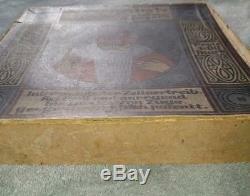 The item "Original Box Antique German Marbles Solitaire! Lauscha Hand Blown Glass & Board" is in sale since Sunday, December 2, 2018. This item is in the category "Toys & Hobbies\Marbles". The seller is "doctornomad" and is located in Scottsdale, Arizona. This item can be shipped to United States.